Today’s guest post is coming at you straight from NYC courtesy of my good friend Arber. We met under non-culinary circumstances during my time as the master of web goodness at The City College of New York. I had the dubious honor of serving as the advisor for his student organization, a cluster of entrepreneurs, programmers and designers who created the brilliant website, In Your Class.com. Funnily, in order to get their student organization up and running as quickly as possible, they found it easier to take over an already established group rather that go through the appeals process to create a new one. Thus, although I am out and out Brazilian/Italian/African-American, I soon discovered that I was the newest advisor to the Albanian Students Organization. The founders (Arber included) were all Albanian, so to prove my mettle, I showed them all I learned from Wikipedia about Albania and had them fill me in on the rest of the important details. I adored the multiculturalism mixed with the laughs, and was totally honored that they asked me to be their advisor in the first place. Over the course of our conversations about the web and media, Arber and I ended up on the topic of this food blog. It turns out that not only was he in love with cooking as well, he was a hell of a chef in his own right. In between creating a new social network to take the world by storm and working through his degree at CCNY, he had worked the line in a seafood restaurant in Long Island. I immediately asked if he’d like to contribute a guest post to my site, and he obliged with the perfect choice of topic – mussels. I was enamored with his recipe in that it addresses the myth that mussels are complicated to make and out of bounds for newbie cooks. As I’ve said before, given their low price point, quick cooking time and ability to stand up to any sauce that you could throw at them (barring maybe hot fudge, but then again, mussels and molé? But I digress), there is no reason that more home cooks shouldn’t include them in their repertoire. There is nothing more social and communal than digging into a mess of black shells and and dragging crusts of good bread through a rich, briny sauce of wine and herbs. Begin by heating the oven at 350°. Cut up the loaf of bread into big slices and place on a cookie sheet. Drizzle with the olive oil, then add a bit of crushed red pepper and minced herbs to each slice. Put the slices in the oven and let crisp up while you make the mussels. Place the large frying pan over high heat and add the butter. Once it has melted, add a small pinch of crushed red pepper, a pinch of salt, and the remaining herbs. Cook for a few seconds until the herbs become fragrant. Add the mussels to the pan, making sure that all are touching the bottom of the pan. Put the small pan on top of the mussels and leave for 30 seconds to bring up the heat in the pan. Remove the small pan and add the white wine. Feel free to eyeball this amount, and use your instincts with this one. Basically, you don’t want to overflow it with wine – just enough to make a good sauce for dipping your bread into later. Put the small pan back on top and leave for 2-3 minutes. Check the mussels to see if they have all opened – if majority of them haven’t, swirl the mussels around the pan, return the small pan for another minute. Turn off the heat and put the opened mussels in a serving dish, discarding any mussels that haven’t opened. 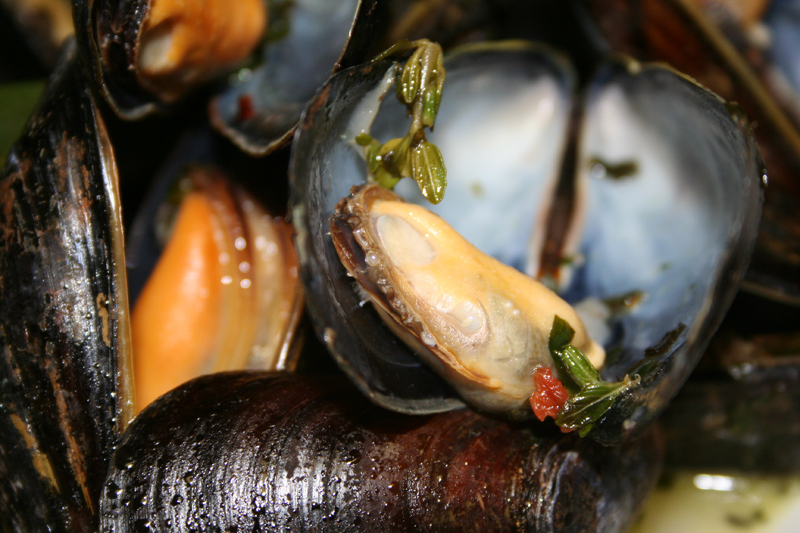 Spoon the buttery wine sauce on top of the mussels and optionally garnish with some lemon. By this time the bread you put in the oven should be nice and toasted – remove and place slices on a serving dish. Use the bread to sop up all of the herb sauce and enjoy the fact that in only a few minutes, you will have created one of the most delicious seafood dishes of all time!